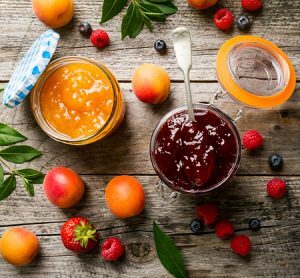 It’s commonly asked—what distinguishes a jam from a jelly, or a marmalade from a conserve? It’s a great question because understanding the variance between the four will help you decide what to eat these very different and very delicious spreads with! A jam is primarily made from whole or cut fruits, and then cooked and pulped with sugar to create a thick spread. If potted correctly, it can last over a year, due to the preservative nature of the sugar. We like it with toasts or sandwiches, tarts, or alongside sharp cheeses! Jelly is a bit different—It’s only made from the juice of a fruit, and then made sweet with sugar. The collection method is more complex, and requires straining fruit through a cloth, or a specific jelly bag. Cooking it with sugar makes it clear, and more fluid. We all know jelly is great with peanut butter, but it also tastes delicious when added to gravy, or sauce. So, if you take what we said before with jam, but make the spread from Spanish or Portuguese Seville oranges, or citruses and you’ll have marmalade—a nice orange paste that is a perfect partner to toast or scones in the morning. Fun fact: marmalade derives from the Portuguese word, marmelos. Finally, we have conserves: the thick spread we all know and love is traditionally cooked with dried fruit, raisins and nuts to produce a sort of chunky texture. If you’re having meat or cheese, then conserve is your go-to. Now that you know the ins and outs of these spreads, come check out our collection at Vermont Homemade Memories! We expertly craft all of our spreads in a wide variety of flavors, bringing you a delightful and unforgettable taste to add to your breakfast, or even the main course! Call us at 1-800-338-5354 to learn more about our jellies, jams, marmalade and conserves.